JAN 28, 2019 - Our science program is changing and adapting to continually bring the most updated meaningful curriculum as well as best teaching practices to Roslyn. At the elementary level, our lessons and new resources are aligned to the Next Generation State Standards (NGSS) and include Disciplinary Core Ideas, Cross Cutting Concepts and Engineering for an amazing program. Our model of science lab lessons now include classroom teachers, which helps to bridge students’ experiences. An Elementary District Science Committee with members from all levels in our district meets to communicate and share with one another. 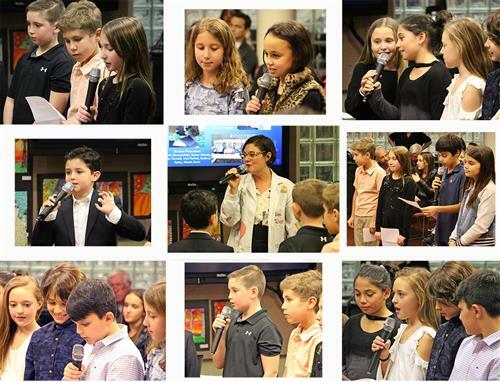 A presentation to the Board of Education on January 24 was shared by some students at Harbor Hill School and their teacher, Theresa Tahany, to spotlight some of this learning that is taking place across our district. Fifth graders discussed how they investigated cooking food during a power outage using a solar oven they engineered, and extended their learning to communities that would benefit from safer ways to cook food. Fourth graders shared how they investigated weather using anemometers they engineered along with thermometers to collect data. They used this data to determine the warmest place to stay on our playground on a chilly day. Our third graders shared their FlipGrid video clips about how they feel their science learning and experiences have changed from when they were younger and followed the older NYS science curriculum, which was the same for grades K-4, as opposed to the newer NGSS curriculum, where each grade has its own science standards. Some aspects of the curriculum that students mentioned included using innovative ways to learn, such as the “escape-room like” Breakout EDU box, and practices like claim, evidence and reasoning. Our second and first graders also shared their FlipGrid video clips, which were about the favorite things they have learned and experienced in science. They talked about learning academic vocabulary terms that help them sound like scientists, such as herpetologists and hand lenses, as well as their excitement for the exploratory model they experience when they walk into the science lab. We hope this presentation provided some insight into some of the learning Roslyn’s youngest students are currently experiencing in the science labs and classrooms at the elementary school level. It is a glimpse of what the amazing students in our district are involved in. Watch for future Roslyn scientists in the years to come!